On Friday the 5th December Team Tactics had our first Corporate Christmas Cooking Event for this year at Piccadilly Circus in the Heart of London. Our clients arrived to a reception of homemade mulled wine which our chef had prepared. The smell filled the room and with Christmas Carols playing in the background it all felt very festive. Our Head Chef then went on to demonstrate how the Christmas food would be prepared and cooked, the group were then split into teams and like Santa’s little helpers with their Christmas hats on started cooking and the wine began to flow. In their teams they prepared a whole host of festive food including a large Italian Christmas Tree cake with sparklers which tasted divine. Once the food had all been prepared and cooked the clients enjoyed their feast of festive food accompanied by more wine, I even managed to taste some of the food and it tasted really good! For the grand finale we dimmed the lights and lit the sparklers on the cake, which went down very well and it looked amazing. Everybody really enjoyed the Christmas Corporate Cooking experience a fun alternative to the normal Christmas party. 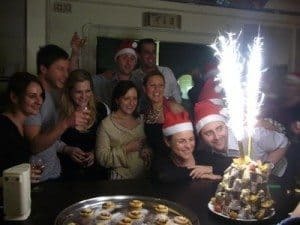 For more information on our Corporate Cooking Events please contact us and look out for more Christmas events for 2009, coming to our website soon!